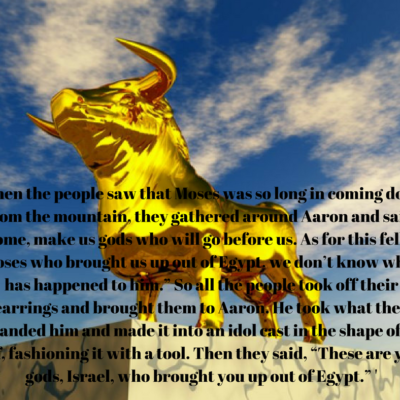 When Moses went to be with God, he was gone for 40 days, and somehow during that time the people of Israel got a little impatient, and decided they needed a new god because the one who had saved them from Egypt has forgotten them. 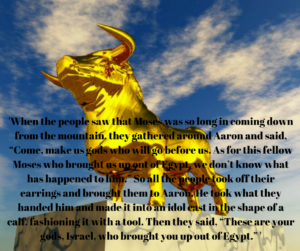 So, Aaron created for them a new God, one made from Gold shaped into the form of a calf. We hear this story and think of how crazy it must be to do something like that after all they had been through with God, to just give up on him so quickly. We won’t even go into how silly it is to make your new god a calf, and not something completely menacing and scary. However, here they are without their leader for less than 40 days and they are looking for something else to lead them. As crazy as we often times think this is, we do it all the time, we give up on God for our own gods we are hoping to save us. In America the god we put before us more than anything is money. We have been trained to believe from an early age that money will be what can fix all of our problems and fix it quickly. So, we put all of our hope into it, and pour all of our time and resources into finding ways to make, and ultimately spend, more of it. Isn’t it funny how not only can having more money make us happy, but we are taught that spending more of it will also make us happy, its a really weird dichotomy where we are always giving and using what is supposed to make us happy, keeping us more tired than we were ever designed to be. This morning, whatever that other god in your life may be, it is time to lay it down and seek to follow him whole-heartedly.